This alarm can be added to the Connected Electronic Alarm Systems. Ideal in case of emergency or break-in, silently trigger the system with a simple push of the button. Power Requirements: CR2032 button battery. Power DC: 1.5V button battery. Operating temperature: -10 to 55 degrees. 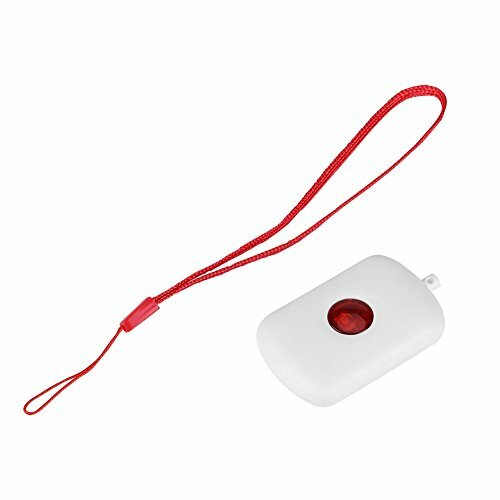 BATTERY OPERATED BUTTON: This panic button is operated by a button cell, perfect used in a big trip, camping or hiking. Ideal for college and student security, walkers, joggers, elderly, students, lone workers and self defense. MULTIPLE WEARING METHOD: Wireless panic button can be mounted anywhere in the house or carried with you, can be worn on hands or neck. Immediately trigger the alarm of the fortress SOS or GSM security system. CAN BE CONNECTED ELECTRONIC ALARM SYSTEMS: This alarm button does not work on its own, standalone, so you must link it to an alarm system.